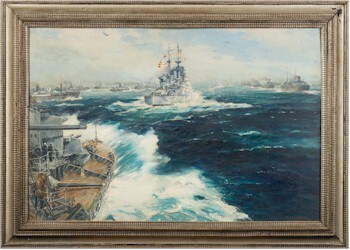 One would imagine that marine artists would have a limited range of subjects to paint. However, the reverse is quite true. Many people will automatically think of the work of Francis Holman (1729-1784) or Thomas Luny (1759-1837) and the traditional style of ship portraits and battle scenes of the 18th century. Not limited to such thinking, marine artists have attempted to capture the sights, emotions and lives of people whose lives depended upon the sea. Outward Bound by maritime artist Frank Henry Mason (1876-1965) depicting a large Naval convoy and air cover, signed and dated 1941 bottom right, oil on board 50 x 75cm (MA15/325). Capturing a view of the coast and the dramatic changes in weather or the sight of a harbour, full of shipping such as the sketches attributed to Nicolas Matthew Condy, or the swell of the harbour by Thomas Rose Miles, portrayed the power of the sea. While Anton Schranz (1768-1839) not only provided a fine view of the harbour of Mahon, Minorca, with the English fleet present, but an excellent topographical record of the harbour that is recognisable today. Later artists such as Commander EE Tufnell (1888-1978) and Claude Graham Muncaster (1903-1974) captured the essence of the new age of power in the warships of the early 20th century. Muncaster also captured the extent of shipping in the busy ports and harbours as Ocean liners and merchant shipping carried their cargo around the world. 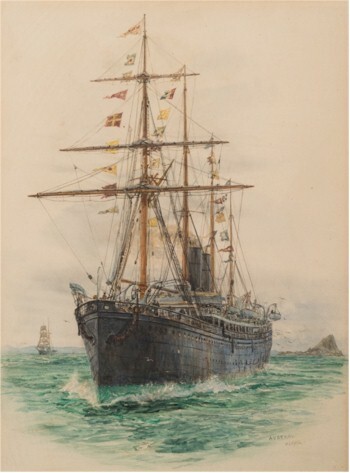 A signed and inscribed watercolour of SS Austral in a Bay (MA15/357) by William Lionel Wyllie (1851-1931).